The countdown continues to the best bar burger from Greenwich to New Haven. And unlike other lists, I actually tasted close to 70 different hamburgers for this list. The “Dino Burger Deluxe” was 6 ounces of Angus beef topped with BBQ caramelized onions, melted cheddar cheese, tomato, house-cured pickles and BBQ mayo. The patty was cooked over a wood grill and the flavor of the meat absorbed a lot of great smoky flavor. The onions were a little pungent but the cheese and BBQ mayo were both great additions, the latter added just a touch of spice. The griddled bun was basic but the grilling increased the flavor and crunchiness. The Dino Poutine, fries covered with cheese and pulled pork, was a great side to go with. 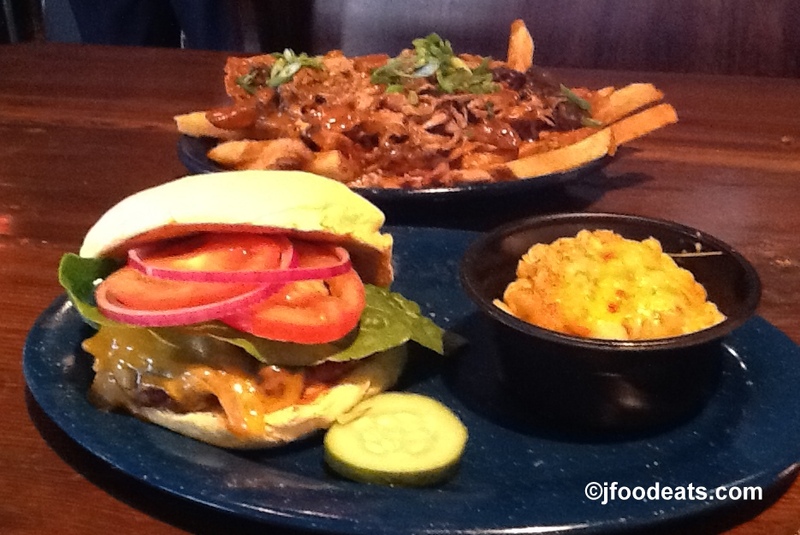 This entry was posted in Stamford and tagged ctbites, hamburger, Jeff Schlesinger, jfood, Stamford by jfoodeats. Bookmark the permalink.